The Varikon Box 3×3×3 puzzle superficially looks like a normal 3×3×3 sliding cube puzzle, similar to Peter's Black Hole, IQube, and Magic Jack. It has a transparent box, apparently containing 26 cubes and a space, so that the cubes can slide around. It differs however in that the cubes at the face centres are fixed onto the central cube, so that there are only 19 moving cubes, arranged along the corners and edges of the box. The box also doesn't have (nor need to have) holes for you to slide the cubes, as simply tilting the box suffices. The cubes are red, and each side has a white or blue spot. When solved, all the blue spots are on the outside, with only the space showing three white spots. There is a tiny hole near one corner of the box, into which you can insert a small rubber pin. This prevents the puzzle from getting mixed up accidentally. Inversion is an equivalent puzzle which does not have a transparent box. Instead the face centres have rims that keep the cubes contained. Its colour scheme is also different - every small cube looks the same, with three red faces around one corner and three blue faces around another. This means that there are many identical pieces, and also that the puzzle can be made all red or all blue, including the parts visible at the space. The Varikon Box was invented by Csaba Postasy, Gabor Eszes, and Miklos Zagoni. The German version of its patent, DE 3,027,556, was published on 19 June 1981. Inversion was invented by Patrick A. Roberts. Its patent, US 4,511,144, was published on 16 April 1985. There are 19 loose cubes and a space. Any even cube permutation is possible, but no odd permutations, so for any position of the space there are 19!/2 cube positions. The space can only really be in the corners, giving a total of 8·19!/2 = 486,580,401,635,328,000 positions. The Inversion has many identical pieces. The pieces only differ in their orientation, and there are 8 orientations they can have. The 19 pieces split into sets of 3, 3, 3, 3, 2, 2, 2, 1 identically oriented pieces. These can be invisibly rearranged in 2!33!4 /2 ways by even permutations. The actual number of positions is therefore 8·19! / 2!33!4 = 93,861,960,192,000. I will use the Rubik's cube notation, so each letter F, L, U, B, R, D denote a clockwise shifts of all the cube around the Front, Left, Up, Back, Right, Down face respectively. Similarly, I will denote each little cube location by three letters (for a corner location) or two letters (for an edge location), namely the letters of the outside faces of that cube location. The pieces of the Varikon Box are unique, so you can determine where each piece belongs. A piece belongs in such a spot that all its blue faces are visible, and all its red faces are hidden. To solve the puzzle you therefore merely have to know how to move the pieces to where you want them. Phase 1: Solve everything but the U layer. Find the little hole in the outer box. This is the location where the space will be when the puzzle is solved. Make sure this hole is not on the bottom layer. Place the correct cube at the DF location. This is easy since there are no other cubes to reckon with. 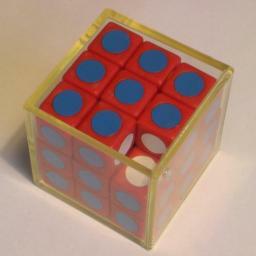 Simply find the cube that has blue spots on the Front and Down faces, but not on the Right or Left faces, and shift it over to its correct position at DF. 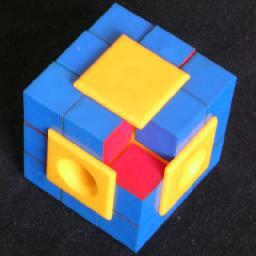 Place the correct cube at the DR location without disturbing the previously solved cube(s). Again this is easy since there are no other cubes blocking access to the DR position. 1. If the cube belonging at DFR lies at FR, then do FR'F'R to put it in place. 2. Otherwise, bring the cube belonging at DFR to the UF location, with the blank space at UFR, and do RRU'R'R'. 1. Bring the cube belonging at FR to the UF location, with the blank space at UFR. 2. Do RU'R' to put the cube in place. Rotate the whole puzzle to the left, so that the solved 2×2×2 block lies at the DFL corner. Repeat steps c-e, thus creating a 2×2×3 solved block. Rotate the whole puzzle to the left, so that the solved 2×2×3 block lies at the DL side. Rotate the whole puzzle to the left, so that the only unsolved cubes in the bottom layers lie at the FR and DFR locations. Repeat steps d-e to complete the bottom two layers. Hold the puzzle with the pinhole at the UFR. Also, put the space at UFR, which is where it belongs. Do U or U' to cycle the pieces in the top layer until as many as possible are correctly placed. 1. Do U or U' any number of times until the two pieces to be swapped are at UF and UR, with the space between them at UFR. 2. Do FR'F'R to swap the two pieces. 3. Do U or U' as many times as needed to undo the moves done in step 1, thus bringing the top layer back to where it was before. Note that step 2 also swaps the DFR and FR pieces, but that can be ignored for now. Apply step c as many times as needed to rearrange the loop of 7 movable pieces of the top layer in the correct order. When it is in the correct order, you will have applied step c an even number of times, so the DFR and FR pieces will automatically have returned to their correct locations. Every piece on the Inversion puzzle has 3 faces of each colour. There is clearly only one corner of the puzzle where that piece could belong, and if there are several identical pieces then they go in that corner and in one or more of the adjacent spots. An edge location therefore has two types of piece that could fit, namely the type that would fit either of the adjacent corners. There is however one corner for which there is only piece available, so each edge location next to it has only one type of piece that could fit. When it is solved, the three pieces next to the gap must be identical, so at the end the gap must lie at one of the corners for which there are 3 pieces available. The picture below shows a blue and a red solution. The Inversion puzzle can be solved using the Varikon solution above. It is generally a little easier though to solve all the bottom corners before the middle layer. Once the bottom layer is solved, any pieces with a wrong colour on top will have to be put in the middle layer.